The most widely used approach for wastewater pipelines condition assessment is to define condition states based on a set of variables collected by visual inspections. A state is defined as “a combination of specific level of variables that provides a complete description of the dynamic behavior of the system”. The current condition of an asset and its likely rate of deterioration is important information in developing a proactive maintenance schedule in the most cost-effective manner. Competent use of locating practices and technologies allows not only more effective condition assessment applications, but also more successful asset management practices. Underground utility locating is an engineering practice that uses new and existing technologies to accurately identify, characterize, and map underground utilities. Benefits include the reduction of utility conflicts, which, in turn, reduces overall project time and cost. It is documented that $3.41 to $11.39 were saved in avoided costs for every $1 spent on underground utility locating. Condition assessment surveys were historically carried out by sending out inspectors to evaluate the defects inside those accessible pipes along the network. Techniques that expose the underground utilities and determine the location. Include exploratory and vacuum excavation. All utility materials can be located. Ease of deployment: traffic control and ground access is necessary for excavation. Ease of interpretation of results: underground utilities are exposed, results are definite. Capabilities: the underground utilities would be exposed; therefore the results of the surveys are definite. The open trench could be used for further condition assessment and renewal activities. Limitations: there is a high risk of damaging utilities if working too close. Application can be costlier compared to other utility location techniques. These methods work by introducing direct current (DC) into the ground through two or more electrodes, and then measuring the resulting voltage difference between another pair of electrodes. The electrode pairs are moved along a surveyed line, and the electrical measurements result in a horizontal profile of apparent resistivity. Effective depth: up to 60 m. However, the soil resistivity is a significant limiting factor. Applicable materials: all utility materials can be located; highly effective for metallic utilities. Ease of deployment: electrodes to be driven into the ground, which becomes a time-consuming and costly task when a large area has to be surveyed. Ease of interpretation of results: highly expensive, time consuming, and needs highly-trained operators and interpreters of data. Capabilities: resistivity surveys can provide high quality vertical locating data for resistive soils with conductive utilities with a high effective application depth (up to 60 m). Limitations: resistivity methods may be useful for a utility search, but not a utility trace. Susceptible to interference from nearby metal structures such as, fences, buried pipes, and cables. Frequency domain electromagnetic methods (FDEM) measure the electrical conductivity of soil by determining the magnitude and phase of the induced electromagnetic current. Frequency domain electromagnetic measurements primarily are used for profiling to detect and map lateral changes in natural geologic and hydro geologic conditions. Effective depth: up to 60 m.
Applicable materials: applicable for all utility materials. Ease of deployment: measurements do not require ground contact. Continuous data may be acquired to depths of 15 m with hand-carried or vehicle-mounted equipment. Ease of interpretation of results: most surveys are done in the profile mode; interpretation is usually qualitative and of the anomaly finding. Capabilities: these surveys are efficient and fast in the right conditions. Limitations: effectiveness of electromagnetic measurements decreases at very low conductivities. Effective depth: up to 900 m.
Ease of deployment: measurements do not require ground contact. • Ease of interpretation of results: experience and sophisticated interpretation skills are required. Capabilities: can be used for faster surveys over larger areas. Limitations: response from metallic structures can be very large and can make results hard to interpret when utility density is high. Microwave pulses are transmitted into the ground from an antenna, and any incoming reflections are monitored at the receiver and passed on to a computer to depict a continuous graphic profile of the subsurface strata. Reflecting surfaces appear as bands on the profile. The application can be a single or multichannel configuration that increases the resolution of the survey. Effective depth: depth of the GPR survey is highly site specific and is limited by signal attenuation, which is dependent on the electrical conductivity of the subsurface materials. The potential depth increases with decreasing frequency, and although the higher frequency cannot penetrate as deep into the earth as the lower frequency, the higher frequency can detect utilities with smaller diameters and provide high spatial resolution and target definition. Penetration is commonly less than 1 m, but can be greater than 30 m.
Ease of deployment: provides continuous profile measurements and is effective for larger surveys. The antenna may be pulled by hand or vehicle. Ease of interpretation of results: experience and sophisticated interpretation skills may be required in complicated cases. Provides subsurface information when rapidly surveying large areas with minimum interference to traffic. Provides very high lateral and vertical resolution. Can be used for faster surveys over larger areas. Clay soils and soils that are salt contaminated crated the most significant performance limitation for GPR. Rocky soils are considered a limitation because of their signal scattering nature. High-energy consumption can be problematic for extensive field surveys. Broad configurations of the antenna beam width can make it difficult for radar to discriminate between closely-spaced utilities. Potential-based methods can be used to detect buried ferrous metallic objects, such as pipelines and tanks, with contrasting magnetite content. Potential-based methods include magnetic and gravity potential. Magnetic potential surveys are far more applicable than the gravity potential-based surveys. Magnetic potential surveys effectively detect isolated shallow ferrous metallic utilities, and magnetized nonmetallic fiber optic cables. Pipe and cable locators are a widely used form of magnetic potential-based technology. Effective depth: up to 3 m.
Applicable materials: highly effective on metallic utilities. Ease of deployment: magnetic potential survey technologies can be handheld or vehicle mounted, and measurements do not require intrusive ground contact. Ease of interpretation of results: although results are easily interpreted, this method can provide inaccurate results. Limitations: magnetic measurements are susceptible to interference from surrounding ferrous features. The radio frequency identification (RFID) electronic marking system provides accurate location of buried infrastructure and site-specific data. A portable, handheld device is used to program and later find electronic markers by transmitting a utility-specific radio frequency signal into the ground. This digital response includes stored details such as a unique marker identification number, the owner of the underground component, its function (splice, valve, service tee, and direction change), and its depth/elevation below the surface. Effective depth: up to 7 m.
Applicable materials: applicable for any utility material. 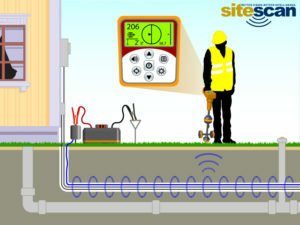 Ease of deployment: tag can easily be replaced on or in close proximity to the underground utilities. Ease of interpretation of results: location and other utility data can be downloaded from the tag remotely without any training or interpretation. substantial amount of information can be gathered about the assets with very low cost. Each RFID ball costs approximately $15 and 600 balls are estimated to be enough to locate and gather information for one mile of pipeline in an urban setting. With new advances, the depth of the assets also can be estimated. tags should be placed and programmed when the utility is in construction stage; therefore, the owner’s commitment to application is necessary for success. A sonde is a small radio transmitter inserted into a pipe. After the sonde is placed in the pipe, a pipe locator is used to locate the sonde. The pipe’s position and the pipes location is then marked on the ground. This process is repeated until the desired information is received. Ease of deployment: accessibility of the utilities is important to deploy and collect the sondes. Ease of interpretation of results: depths calculated from sondes should be used with caution. sondes are effective for most diameter pipes and can navigate through joints and elbows. Sondes are not affected by other nearby sources of interference, such as congested utilities, rebar, and guardrails. sondes are reliable only for the horizontal location of the pipes. Sondes only provide locations of the pipes into which they are inserted, and for only that distance for which they can be pushed or pulled. Multisensor technologies are a combination of multiple sensors working simultaneously to provide results. These technologies can be two or more sensors of the same technology and/or the application of multiple sensors from two different technologies. Effective depth: depends on the technologies employed. Applicable materials: applicable materials depend on the technologies employed. Ease of deployment: sensor platform can be deployed by survey crew or towing vehicles. Ease of interpretation of results: the simultaneous employment of these technologies provide higher definition survey results with the combination of two or more outputs from employed technologies. Capabilities: the combination of two differ technologies provides a platform in which these technologies cancel out the limitations of each other for given site conditions. Limitations: these technologies are currently emerging and need specialized software and experience to accurately interpret the results.